Cheese, originally uploaded by BrianEden. i love flickr. 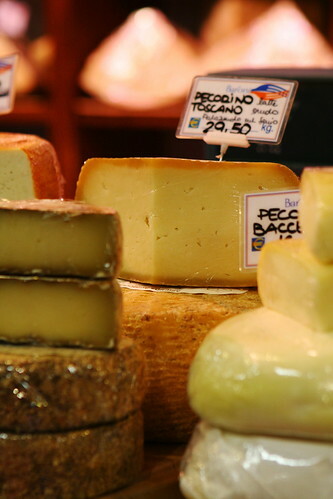 i was searching through my photos for a shot of the baroni stand at mercato centrale in florence, where paola and alessandro baroni have curated their findings of the rarest, softest, freshest pecorini toscani. i couldn't find one of my own, but lo and behold, this lovely shot was just a couple of searches away. i'd recognize that handwriting anywhere. you might be wondering why i am suddenly so concerned with cheese as to write two very long posts about it. well, i think about cheese a lot to begin with, but now that i have this ridiculous cast on my arm and it's suddenly fuh-reezing outside, only one long-sleeved garment i own has fatty sleeves big enough to go over my chubs arm--the sweatshirt i got at the old artisan cheese shop on california st. 6 years ago. it has a cute little mouse on it, and it says j'aime le fromage in curlicue cursive on the back. i never get to wear this sweatshirt, and now i can't wear anything else. ok, back to jean d'alos: he's an affineur--a dying breed--a man who takes good handmade cheeses and makes them really special by aging them with a craftsman's touch. one of the things that sticks in my mind from the lectures he gave is his acknowledgement of everything that women have done for cheese. farmhouse cheeses--specifically the comte that he is so famous for--were invented by farmwives as a way to make milk last throughout the winter. jean's wife pascale shares a lot of his work, and together they travel through the countryside to choose cheeses to bring home to treat and age in their caves...a.k.a. the catacombs beneath bordeaux. they do magical things like rub cheeses with piment d'espelette, sauternes, saffron, juniper berries, cayenne pepper, savory, and peppercorns, wrap them with burlap cloths, and wash them repeatedly with brine during the aging process. he even ages one of the crazy/famous jose bove's cheeses. jean d'alos and his family are so very special because they still do things the old way. they give the cheeses the care and time they need to go from good to perfect. these days, most cheeses are made in huge stainless steel factories, and the art of the affineur is considered by most to be irrelavent. in this fast-paced world, who has time to wait two years for some comte (the most popular cheese in france) when you can buy a six-month one at the store for a lot less money? i encourage everyone to stop by a real cheese shop in your town sometime, and ask for cheeses that have been aged by a real affineur, or to taste artisan versions next to their factory-made counterparts. if my boo-hooing hasn't been enough to pursuade you, you will surely be able to trust your own taste buds.